WHAT IS A WEBSITE PLATFORM (AKA CONTENT MANAGEMENT SYSTEM)? First, you might be wondering what exactly a website platform, or content management system, is. A website platform is a front-facing application or online interface that allows you to build a website by adding, modifying or creating content, even with limited experience or knowledge of code or web design. There are a number of different website platforms on the market, each one with its own customized interface and capabilities. A real website built on a website platform, as opposed to a social media page, gives you complete control the design and content on your site. Leading site builders like Squarespace, Wordpress and Shopify are constantly making improvements that help streamline the process of building and launching a website. With so many options, it can be overwhelming and confusing to choose which platform is going to work best for your business. At the highest level, you want to ensure your site will look and perform at an optimal level, however there are a number of factors to consider when choosing your content management system. Before looking at the various options available, we recommend writing down all the features you would like to have on your site, as well as your overall website goals. Do you want to have blog with a sidebar? Are you looking for a website that can grow and expand with your business plan? Do you need an e-commerce component? These are all important considerations as you decide which website platform is right for your business since you want to be sure that your website can grow and evolve with your needs. What do you want your website to DO? Will you need e-commerce or to sell services directly? Slideshows? Videos? An events calendar? Think about all the functions you want of your website, both now and in the future, and write them down. Are you pretty tech-savvy and can google a solution with the best of them? Does the sheer though of seeing </> send you crawling under your desk? Take into account just HOW easy you need your platform to be. But remember that ease of use can often inhibit some of the features and functionality, so it is a balancing game. If you want a super advanced website, you’re going to need a super advanced platform. Is cost a factor in deciding which platform you will ultimately go with? While there are the straightforward costs of website fees and hosting, there can be hidden fees as well. Like when you discover you can’t make a simple change and need to call a developer for help. Again, weigh your costs with your needs and functionality. You can’t get a Bentley if you only have the budget for a Honda. Will you need any custom development, ie. a custom client portal, a specialized internal system, or something that wouldn’t typically be available out of the box? Some platforms offer the ability for plugins, add-ons and complete custom development while others are WYSIWYG. What is the five-year plan for your business? How do you plan on scaling it? Your website should be able to scale alongside your business instead of requiring you to rebuild on a platform every year or two because the one you choose can’t accomplish your future business goals. Who will maintain your site and make regular updates? Do you want to pay for ongoing maintenance or do you intend on doing it yourself? Is there a person on your team you can delegate website management to? Whomever is responsible for your website maintenance post-launch should be trained on the ins and outs of managing the website, and if you aren’t paying for a company to maintain or manage your site, you need to be able to train your internal designees to take on these responsibilities down the road. Squarespace is a self-contained platform that works seamlessly and is fully managed from top to bottom, meaning there’s never any need to update software, plugins, or widgets; patch security issues; or worry that changing one thing might break something else. This also means there’s rarely any need to pay for additional third-party apps or plugins since most functionality is integrated directly into Squarespace. + Ease of Use & Flexibility, including customizability. Everything from the colors and fonts to the logo and graphics can be customized to your brand. + Affordability. Choose to pay a monthly or annual plan and your ready to launch. + Automated Security & Backups. No worries losing your site content or experiencing periods of downtime. + Automated updates & 24/7 Customer Support. Get the help you need, when you need it. + Requires very little ongoing maintenance by client beyond adding your new pages and/or content as your site evolves. + Built-in SEO & Analytics. Newly improved and more advanced settings just launched in December 2018! + Constantly improving and responding to their customers needs with new features and functionality. + Every Squarespace template includes a unique mobile experience that matches the overall style of the website, so content looks great on every device, every time. Shopify is an all-in-one, turn-key eCommerce platform. This complete eCommerce solution is specifically built for online merchants, allowing you to set up an online store to sell your goods or digital products and is the ideal choice for anyone who wants an online storefront. You can easily organize your products, customize your storefront, accept credit card payments & track and respond to orders. In addition to several free themes, Shopify’s online marketplace is filled with theme designs that have been vetted and approved for purchase. On the front-end, Shopify is also a drag and drop interface making it easy for novices to design an e-commerce store. On the other hand, developers can develop custom solutions for shop owners based on their functionality needs. + Fully integrated for e-commerce out of the box and accommodates brick and mortar operations. + Connects with social media platforms to allow customers to easily purchase directly from Instagram, Pinterest, Twitter & Facebook with a few clicks. + 24/7 anytime support. Will even help with some design and code edits. + Offers built-in speed and security. + Crawlable, clean code for SEO purposes. + Accept payments from 70 different payment processors in different currencies. + Offers a number of add-ons to extend the functionality of your shop. + Customer Accounts & Abandoned cart recovery. + Grant different permissions to staff or contractors to help manage your online shop. Wordpress is the most powerful content management and web publishing system in existence, but with that comes a little more complexity behind the scenes. Wordpress powers more than 70 million websites and can achieve anything just about anything you want on the web through custom development, from e-commerce to advanced membership sites and everything in between. + Ease of Use & Flexibility, you can literally do everything with the help of a developer. + Affordability (it's free!). You just need to pay for hosting and your domain name. + Endless possibilities to add or integrate new functionality with thousands of plugins or custom development. + Extensive SEO & Analytics using Yoast SEO plugin. + Maintain full control over your website and its content; move it, copy it, back it up at any time. + Your website can update and grow infinitely alongside your growing business. While there are numerous other platforms like Wix, Weebly, Magento, and even Showit that offer alternatives, we feel that these three platforms are the top choice for small to mid-sized businesses needing an easy-to-manage website solution. Wondering which platform is best for your business needs? 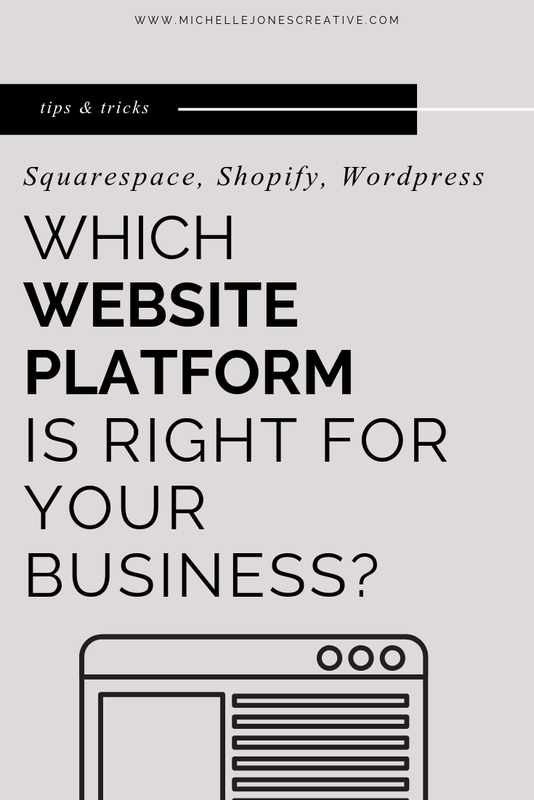 Click below to take the quick quiz and find out which website platform is right for you.